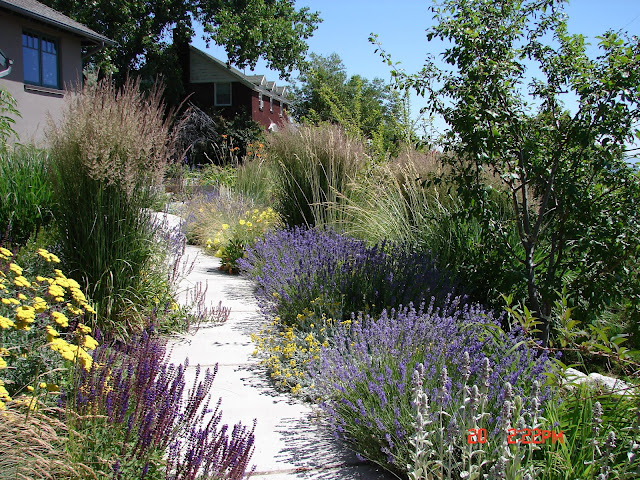 New Utah Gardener: Five Good Reasons For Waterwise Gardening! Five Good Reasons For Waterwise Gardening! 1 - We live in a place with a relatively dry climate. Utah is the second driest state in the nation (Nevada is the driest), receiving an average of about 13 inches of rainfall per year. In comparison, Seattle gets 38 inches per year and Atlanta gets 48 inches per year. It is very dry here. 2 - Waterwise plants (either native to our region or transplants from other parts of the world) do well in our climate. They require less water and they are easy to grow. 3 - Water costs are high for thirsty plants and green lawns. If you could water half as much, your monthly water bill would be a lot lower!! 4 - Water use could very easily be restricted for us in Utah, as it is in Colorado, Arizona and New Mexico. In those places people are only allowed to use certain limited amounts of water on their landscapes. If we have another drought and our population continues to grow, there just won't be enough water on the Wasatch Front for us to water our yards in the manner to which we have become accustomed. The experts have been saying for a long time "it's not a matter of if, but when" - water restrictions are likely in our future. 5 - Because of likely water restrictions, it's a great idea to get to know and love some waterwise plants now. The good news is that waterwise landscape design is not limited to rocks and yucca and cactus. There are hundreds of plant choices for us and we can create interesting and beautiful outdoor spaces with waterwise plants! !